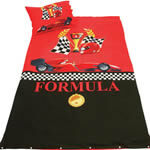 Home Office Stores stocks an enormous variety of children's beds. 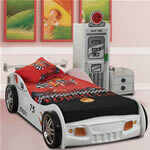 Whatever your little one's age or taste, we have the right bed to suit. From cot beds for babies and toddlers to children's beds with integrated play areas, there is a huge range of options available. 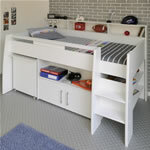 If space is a challenge, several of our children's beds offer ingenious solutions. 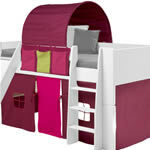 Several come with integrated storage space to help keep your child's room tidy. 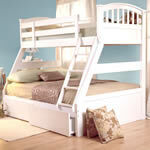 If you need children's beds for more than one child, bunk beds don't have to be boring. 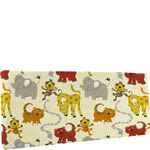 We have a number of unique designs that are stylish as well as fun and functional. Our high sleeper beds can enable you make the most of the space in your child's room, with an area underneath that can be used for storage, to put a desk for doing their homework, or to keep an arm chair for chilling out. 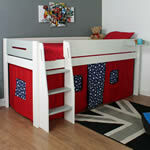 Our selection of children's beds also includes mid sleeper beds which come with either a storage area, or a play tent. 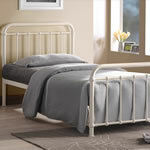 We also supply single children's beds for a more traditional look, and cabin beds with sturdy rails to keep your child safe. If your child wants to express their personality in their room decor, one of our themed children's beds might be the perfect match.